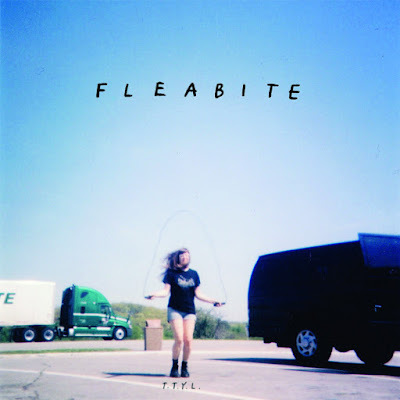 The Le Sigh: EP: Fleabite - T.T.Y.L. Fleabite's T.T.Y.L. is for all of the homebodies out there. There’s something that only a few people know about me. My boyfriend knows, my parents know, my dog’s probably noticed, and everyone that’s ever been into my bedroom has probably noticed too. It’s a routine I’ve been stuck on for a good while; a habit I can’t break. It’s something I’m hooked on: it’s that I have not stopped listening to The Le Sigh Vol. II since it came out. I can'y stop, and I probably never will. The tape is constantly filling every silence in the back of my brain – it literally has not been taken out of my cassette player since I first got it in the mail, asides from when I have to flip it over. The compilation summarizes every sound for every feeling I’ve ever felt, and every track resonates in ways I can’t explain. I could give a track-by-track rundown of this compilation and talk for days. But it’s cool, don’t worry, I’m not here to talk your ear off. Today, I just want to talk to you about one thing, one band, one 7” – Fleabite’s T.T.Y.L. Fleabite's latest release features the song I know best from The Le Sigh Vol. II, "Missing Everyone" – the one song I kept getting stuck on, as I rewound it to play it for the millionth time. "Missing Everyone" speaks to me both in sound and subject, so, two steps in to this release, I already felt right at home. T.T.Y.L is a record that will resonate with any homebodies out there. It’s shaded with that familiar lo- fi feeling, with an underside layered with fuzzy guitars that slow down and pick up as this record goes from start to finish. This is all topped off with the melodramatic tone, singing for the feeling that encapsulates this release: the constant worry of letting moments pass you by. Say you’re me – you’re stuck in your room, rewinding your favorite cassette tape and letting it play through, over and over. You’re too nervous to go out tonight, so instead of exploring the unfamiliar, you stick by those speakers and stay in (but end up regretting it later). Well, Fleabite has written T.T.Y.L for this very feeling – for you, and me, and all the other homebodies out there: “But if I stay at home tonight / then I am swimming in regret / I think of all the things I missed / and all the things I never said”. Fleabite has made a record that has pulled me out of my rut – out of my bedroom, out of the familiar sound of my favorite cassette tape filling the silence in the back of my brain. I’ll get up, I’ll go out, and I’ll be playing this record the entire way to wherever I’m going, to keep blaring out those nerves that keep coming up in my stomach. Fleabite’s T.T.Y.L is up for sale via Puzzle Pieces Records – and I think you’re gonna need it, if you need someone to talk you through these sorts of frantic feelings. I know I do. Listen to Fleabite on bandcamp.